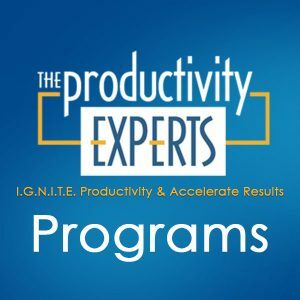 Our Productivity Coaching Programs are designed for people who want to jumpstart their performance and productivity through coaching and support. A game plan with specific goals and deadlines to produce the results you desire. Coaching and support to help you continuously improve your results. The joy of having complete control of your work environment. This 3-week program is designed for individuals who want to experience the impact that coaching can have in their life while exploring the best options for their ongoing coaching needs. This 13-week, goal-specific coaching package is designed for those who want to increase their performance and productivity through coaching and support. These clients value the clarity, weekly accountability, inspiration and discussions regarding their obstacles. The meaningful support of the weekly/monthly coaching ensures that progress is maximized. It takes 90 days to start creating habits, so this program will get you there. This 6-month, goal-specific coaching package is designed for those who want to improve their performance and productivity through coaching and support. These clients value the clarity, weekly accountability, inspiration and discussions regarding their obstacles. The meaningful support of the weekly coaching ensures that progress is maximized. 6 months will not only give you a chance to create long lasting habits, but will also give you the support needed for working through the daily routine of constant changes in our work and life environment. This 12-month, goal-specific coaching package is designed for those who want to make their performance a priority and improve their productivity through continual coaching and support addressing daily life issues. These clients value the clarity, weekly accountability, inspiration and discussions regarding their obstacles. The meaningful support of the weekly coaching ensures that progress is maximized. This coaching package is designed for individuals who want the flexibility of coaching when significant choices or occasional accountability and support is needed. While progress is best made in a weekly setting, this package works best for clients who have either completed one of the other packages or for the busy executive who wants to schedule a coaching call when most needed. Your Coaching On-Demand session can be scheduled within 48 hours, upon request.